This large Nantucket Oval Basket is crafted with a cherry wood (shown) or oak wood oval hardwood base, 6mm cane staves, fine 2mm cane weaving, and traditional cherry or oak hardwood rims. The hardwood cherry swing handle (shown) is attached the "long way". This is a more updated "contemporary" look. The basket handle can also be crafted to be attached the "short way", as is the original, at no additional charge. The handle will be attached to the Nantucket basket with your choice of Bone or Ivory knobs and washers. 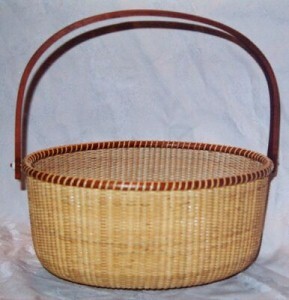 The Sandsbury Oval Nantucket Basket measures 13.5" long x 8.5" wide, 6" high and 13" tall at handle. Signed and dated by the basket weaver. The last two photos show the original antique Sandsbury Nantucket Lightship Basket and the original Sandsbury Nantucket Basket together with my contemporary Nantucket basket. Photos are compliments of Captain Sandsbury's Great-grand daughter, who is the current owner of both of these fine baskets. Although I am no longer accepting orders for the Nantucket Basket Oval Sandsbury, I may craft a few of these per year. When available for sale, you can purchase it directly from my Simply Baskets website.